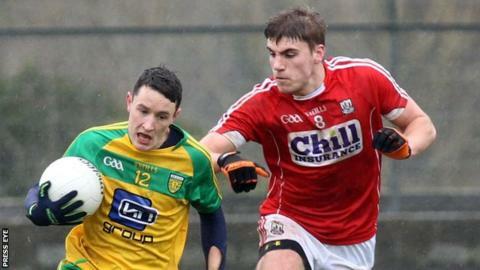 Donegal continued their impressive start to Division One of the Football League as they earned a 2-14 to 1-7 win over a woeful Cork at Ballyshannon. Midfielder MacNiallais was one of numerous impressive performers for Donegal as the home team's scores were spread around, with regular scoring talisman Michael Murphy restricted to a single point at Father Tierney Park. As Donegal were able to run through Cork in the early stages, points from Paddy McBrearty, Ciaran Thompson and Murphy put them three ahead before O'Reilly netted in the 14th minute after his clever exchange of passes with the excellent Eoin McHugh. Cork fought back with an unanswered 1-3 to cut the margin to a point as Hodnett netted after Peter Kelleher had beaten Eamon McGee in an aerial duel. Kelleher was winning his battle with McGee at that stage but MacNiallais' superb long-range point started a run of five straight Donegal points before the break with Anthony Thompson and McBrearty among the scorers. The game was put to bed in the third quarter as Donegal hit a further unanswered 1-4, with MacNiallais netting in the 54th minute. That goal extended Donegal's lead to 2-13 to 1-3 and while Cork hit four of the last five scores, it was still a rather chastening afternoon for the Rebels after their impressive win over Mayo last weekend.